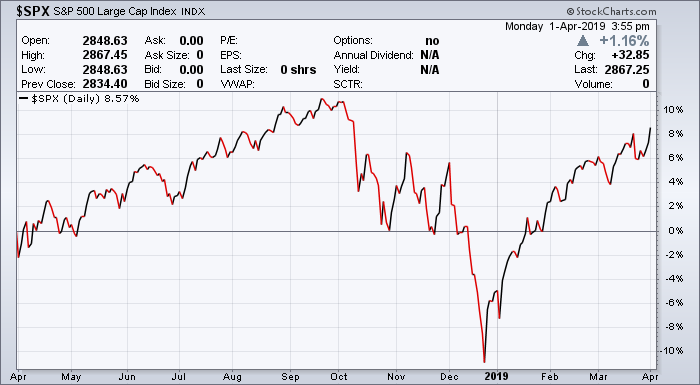 You are currently browsing the Mark's Investment Strategies Blog blog archives for April, 2019. December sell-off, and held onto your investments, you are up about 8% over the past 12 months. Based upon the indicators above, I expect that we are nearing a top in the market and should be rolling over. 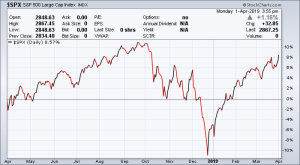 We may have some continued upside as the computerized trading systems try to break through the all-time high, but the resistance is strong overhead and the indicators are mostly pointing to a weakening market. Figuring out the indicators is never just a black and white decision, there are always nuances to it, plus they are just indicators and not commandments. However, by and large they provide information that is critical to staying on the profitable side of the stock market. As a result, we have been raising cash and will likely continue to do so as the market rallies toward the all-time high (if it does). Risk Management is a key part of active investment management, and right now the risk is to the downside.